Our 6th grade classes used Bluestar for a fundraiser. Not only did Louis provide great support prior to the event, they helped with advertising by posting on their website and providing banners and flyers. Not only did they provide ALL the manpower…but, they dropped off a check within a week! I had heard horror stories regarding not being paid for months after the event or never being paid. “We at Horizon Navigation, Inc. want to sincerely thank you for your service. Louis, Alex and the company all proved to be professionals being punctual to start the task and very efficient during. Within hours, they managed to clear out a two story building (4100 square feet) worth of electronic equipment. They hauled away our electronics without leaving a mess and even supplied us with a recycling certificate upon completion. 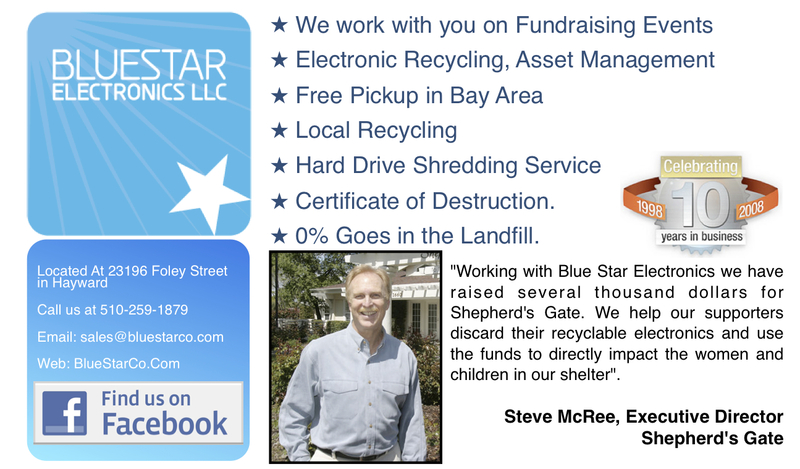 I would highly recommend any company needing electronics recycling services to look to the professionals at Blue Star Electronics. Transitioning to a new office space is always a stress filled time, but thanks to Blue Star Electronics for making the experience so much easier.” T. Le Horizon Navigation, Inc.
I’ve been doing business with Blue Star for about 7 years now. I have to say great group of guys and team over there. They are more then willing to work around my scheduling of pick up’s, Which in return makes my life a bit easier.Their Great response time helps my achieve what I need done. And not to mention their web site is easy enough to navigate through. Oh… and did you know they also sell refurbished electronics ?? that’s right check them out, I was fortunate to learn about them and so should you. I would definitely recommend Blue star and spread the word to others . Thanks again for the pick up. We will definitely use your service again when we have another bulk of e-waste on our hands. Great service! I was looking for a back-up 17″ monitor for my home system. Didn’t want to spend even $120 at Frys. So Yelped around and found under “Recycled computers” BLUE STAR ELECTRONICS. Besides being right down the street from my work, Tami and the owner, Luis, as the other review stated were super-helpful. Not only do they have a huge inventory of used equipment, they had a full-time technician on hand to show me the various monitors to compare resolution and color. Unbelievable. Don’t expect a fancy showroom, but expect, great selection and great service. Oh yeah… and the price was only $50 for a Dell monitor. Now if this wasn’t enough, they are moving offices on my same block next month. OH YEAH… One more thing: THERE IS A 60 DAY WARRANTY on the equipment!! Welcome new neighbors, Tami, Luis and the IT guy! Blue Star Electronics is definitely your ultimate electronic recycling solution provider. They took the liberty to even come to my apartment, which is not far from one of the companies that they work with, to help me with my old school big mama TV. The staff are professional and efficient. A minute they were in my apartment to move the TV, and then they were gone the next minute. This is my best e-waste recycling experience yet!!!!! Blue Star definitely deserve 5 stars!! !